'Wasted Space' by Michael Moreci and Hayden Sherman downshifts the pace a little this month giving Billy and Molly a chance to hang out and tell their backstories. There's still some action but the meat of issue two is the nuanced contrast of ideas that Moreci uses to lay out his thesis. Moreci uses a cerebral approach to his comic writing. His stories tend to have layers. You can see that in Burning Fields and the Roche Limit trilogy. With 'Wasted Space' there's a lot on his mind but makes it completely accessible with engaging characters put in extraordinary circumstances. Billy is living out of a bottle after revealing himself as a false prophet and Molly escaped a life of real prophesizing to find him and stop the evil galactic leader. The leader Billy inadvertently helped put in power. Now they're both being hunted while Molly's evangelist father battles her anarchist brother. There's a lot going on but it's the exchange of stories between Billy and Molly that I thought was especially provocative. Billy was the supposed prophet. In a time of turmoil, some people turn to religion to ease their anxieties and seek out the gospel for peace of mind. They seek guidance and hope in the word of a deity that will soothe their souls. Billy as a prophet was the conduit to provide that message. After all, he could see the Creator, the Creator spoke to him. Sure, it manifested itself in the form of a slick-talking adult-size version of his childhood toy robot that no one else could see but still, He ensured Billy that His message was what needed to be heard. So, despite protests from some in the crowd, Billy carried the Creator's message to have patience and keep the faith that the galactic leader Devolous Yam was trustworthy and that the resistance should cease immediately. They listened, took heed of the Creator's words and entrusted their fate to Yam. And it all worked out worse than anyone imagined. Billy became persona non grata. While Billy wielded influence from a fictitious divine providence, Molly Sue carried actual power. Her ability allows people to see their future, good, bad, or indifferent. No sacrament or dogma to adhere to. If you gave Molly a chance to rest her hands on your face then that's all you would need to see what your future holds. For one gentleman, he was horrified at was to come. He was appalled and called Molly a demon. Yet, he could not escape his fate. The faithful entrusted their lives to a man who may just be suffering from delusions and isn't a prophet at all. Another man used his daughter's gift to make money and treat her like a carnival act. The true prophet and the believer both exploited, one for money and the other for their consent. We've all seen the selfishness of the self-righteous who preach the gospel while bilking their flock to build mega-churches, million dollar homes, and crowdfunding for jet planes because "God said so." If they'll believe a man has God's ear they'll devoutly give up their money or place their faith in anyone He endorses. Meanwhile, another charlatan will trade his daughter's true gift for the money. True faith and true power are wasted on the whims of mortal men who value control and wealth over enlightenment and benevolence. With all that aside, the art is uniquely brilliant with a sketchy, blocky style that gives this story its own sense of visual style. Hayden Sherman creates a funky and lively science fiction landscape that reminds me of The Fifth Element, Star Wars, with a little Pacific Rim thrown in for good measure. Jason Wordie is as good as ever as he adds so much depth, texture, and scope with warmer darker colors. 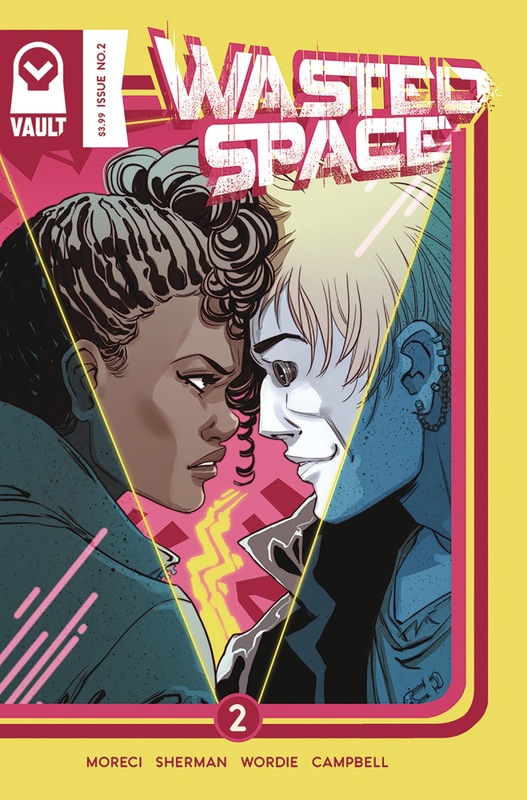 'Wasted Space' is as much a wild sci-fi adventure as it is a thoughtful exploration of the loss of faith and how to regain it. Billy and Molly have their work cut out for them as they search for the galactic leader and fend off their trackers. If you want to talk about great character development this is the issue that will make you care and invest them. Moreci, Sherman, and Wordie have put together a rousing sci-fi story with brains and guts.